RIM, Nokia and Apple provide Backdoor access to Indian Govt. for exchange of Indian market presence! This looks like precisely the reason why Government has been so silent on matters pertaining to access of data from biggies like Nokia, RIM, Apple and others. They made a big hue & cry about it earlier last year, but everything went silent and no action was taken after threatening the likes of RIM & Nokia. The real reason seems that these telecom & software companies may have made a secret tie-up. And if the hacker group and leaked memo documents are to be believed, Indian Government Agencies already have full access to all your communication on mobile. 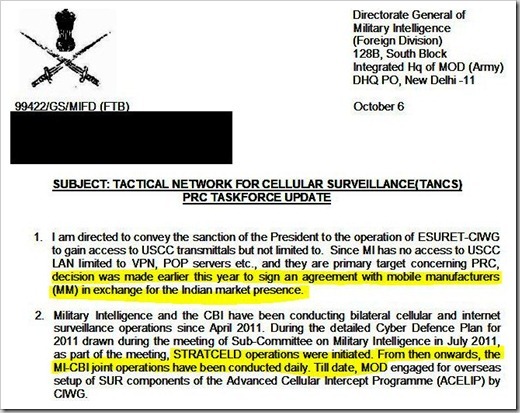 According to a memo leaked by hacker group called – The Lords of Dharmaraja - few days back (which was earlier posted on pastebin, but later was removed), who had hacked into Indian Military Intelligence servers, clearly gives details of the API specifications as well as the memo document. The above 2 images are from the entire 6 page leaked memo document that was released by the hacker group. 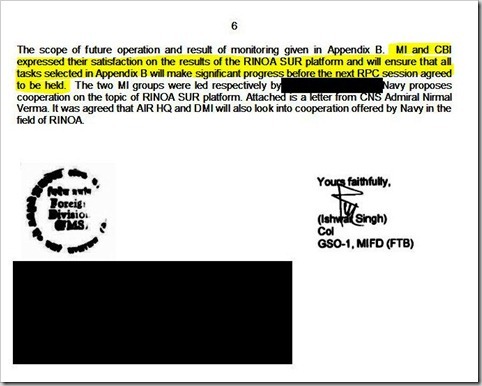 If you see, in the first para of the memo, it is clearly stated that the agreement was signed with these mobile manufacturers in exchange of Indian Market presence and the last para of the memo states that the security agencies (MI and CBI) are satisfied with the results of RINOA SUR platform (RINOA stands for RIM, Nokia and Apple). See the highlighted text in images. The big question here is – What about privacy? Is this ethical? and more so what can the Blackberry, Nokia or Apple users do about it? India remains most challenging country for Expats! I would to see this information in the lame stream media, but probably will not. I would like to see what possible sanctions might be used to punish the “INDIVIDUALS” who sole out their country. I would not be interested in fines for the corporations. I honestly believe that the deliberate sabotage of secret communications is treason and should result in lengthy prison time. Along with prison there should be fines that impoverish the corporate officers and all directors responsible. I would make examples of these criminals. I would to see this information in the lame stream media, but probably will not. I would like to see what possible sanctions might be used to punish the "INDIVIDUALS" who sole out their country. I would not be interested in fines for the corporations. I honestly believe that the deliberate sabotage of secret communications is treason and should result in lengthy prison time. Along with prison there should be fines that impoverish the corporate officers and all directors responsible. I would make examples of these criminals.